When I was a kid, my parents did what they had to do to ensure that I had what I needed. One example of this was the Weekly Reader Book Club. (I know! Blast from the past, right???) Some of my most treasured books came from Weekly Reader, “The Day Jimmy’s Boa Ate the Wash,” “Happy Birthday, Moon,” “Gus Was a Friendly Ghost,” the list goes on and on. When our little boy was born, my Mom gave me those books and now I get to share those with him. The other night at bedtime, rather than reading the usual “Pete the Cat” or “Cat in the Hat,” he brought me a book that I hadn’t seen in years. One, in fact, that I had forgotten about. He crawled up into my lap and handed me “Stone Soup” by Marilyn Sapienza. The book is a brilliant version of the classic story of two weary travelers who come into a town that refuses to offer them shelter and food. The travelers announce they will make stone soup. And little by little, they add flavor to the soup with a few items from each of the villagers. While they didn’t want to feed the travelers, they find that by all contributing a little, they are able to create a grand feast shared by all. It’s just a fabulous story and as I realized a great representation of what I’m trying to do here with Southern Bite- teach people to feed one another. So many times people are intimidated in the kitchen. But teaching people to prepare simple, easy meals demystifies “cooking” and shows them they can do it. As people cook more, they become more comfortable and try other recipes. For me it’s about getting folks to the table together to share a meal and share their lives with one another. Now, go cook something! Place roast in bottom of slow cooker and toss in garlic cloves. Chop celery, onion, and potatoes into large chunks (see photo below for size) and pour over roast. In a medium sized bowl, combine Dales, broth, mushroom soup, and pepper. Pour over vegetables and roast. 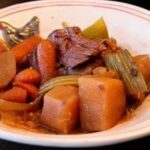 Place top on slow cooker and cook for 7 to 8 hours on low or 3 to 4 hours on high. Place roast in bottom of slow cooker and toss in garlic cloves. Chop celery, onion, and potatoes into large chunks and pour over roast. In a medium sized bowl, combine Dale's, broth, mushroom soup, and pepper. Pour over vegetables and roast. I got to have some for my dinner also and it was wonderful. Stacey you also need to talk about those wonderful lemon cupcakes you baked also !!! I’m going to try this version soon, thanks!!! Do you know of any substitute for cream of mushroom? That is one thing I can not stand! I’ve even tried to puree it before hand, but still manage to bite into chunks of mushrooms and it makes me want to gag! Try this… mix the liquid stuff together and run it through a strainer before putting it on the roast and that should remove the mushroom bits. The other option would be to leave it out all together. It should work just fine without a substitution. I’m not a fan of cream of mushroom soup, either. What I do is substitute a different “cream of…” soup. For this recipe, I’ll probably try cream of celery or cream of potato. What about using a differnt flavor of cream soup. My niece is allergic to mushrooms so she always subs cream of chicken. My mother subs with either cream of onion or celery. You can absolutely substitute another “cream of” soup. Onion or celery would probably be best in this particular recipe. Thanks for another easy yet tasty recipe, Stacey! BTW…were we suppose to notice the ‘chicken’ bowl you served this ‘beef’ dish in?!!! Or was it just a coincidense? Either way, it gave me a chuckle…and a great way to start my day!! 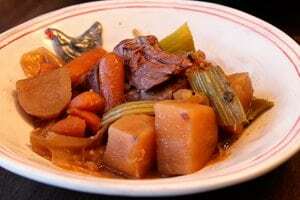 “Stone Soup” sure holds a special place in my heart! “Stone Soup” brings to mind the days when my boys were in nursery school and each child brought in an ingredient to make Stone Soup!! Precious! I still have some of my books from the Weekly Reader book club! I loved getting those books! Thanks for the walk down memory lane! Thanks for sharing, Tina. I’m so glad it brought back some great memories for you. Do you use the Regular ” Dales” or the low sodium “Dales” Thanks!! I typically use the regular Dales, but I’m sure the low sodium would work as well. Stacey, I am so glad I have found your website!! Being from Alabama, I find your recipes are so much like my Mom’s and my grandmothers. 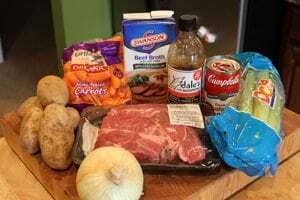 Can’t wait to try the roast recipe for my hubby and son. Stone Soup was always a childhood favorite book. Keep up the good work, Stacey. Thank you for sharing your recipes and life with us! Awww, thanks so much, Kelly! I sure hope y’all enjoy some of the recipes! Where are you living now? 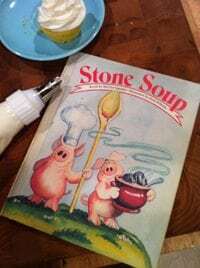 I also remember the book “Stone Soup” and every now and then someone will ask me what I am making and I will jokingly say Stone Soup! I am enjoying your website and recipes. 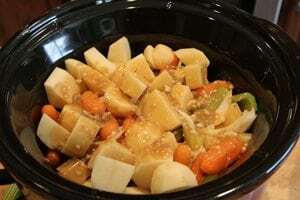 As a long-time slow cooker fanatic, I always put my vegetable on the bottom & the roast on top. Have never used the Dale’s on a roast before, but sounds good. If time permits, I like to sear the roast before cooking. A trick I picked up in a cooking school – gives the meat lots of flavor. I really enjoy your recipes!